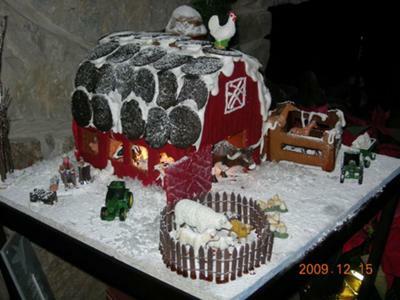 Money Back Guarantee This gingerbread barn template is super fun to decorate! 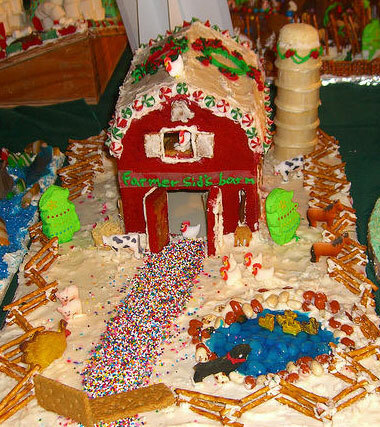 Make barnyard animals (or use candies and cookies already shaped like animals), add a silo made of stacked ice cream cones, a pretzel fence, and more. 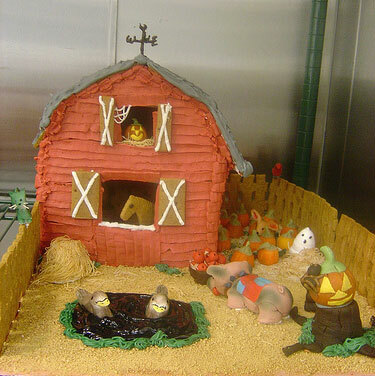 Check out the little bale of hay, the tree stump, pig (complete with curly tail), basket of apples, and the pumpkin patch! The Halloween details are terrific too! The fence is simple but perfect to complete this barnyard scene. To use your gingerbread barn pattern, you simply print the .pdf file (we suggest printing the pattern pages on thick, card stock paper, but regular is fine too), cut the pattern pieces out of paper, lay them on your rolled out gingerbread, cut along the lines, bake, assemble, and decorate. Don't forget to take pictures along the way! This pattern builds a barn that is roughly 7"W x 9"D x 8"H but you can enlarge or shrink the house by adjusting your printer settings. Return Home from gingerbread barn template page.